This weekend the motorsport world will be incredibly busy. Not only does Formula One return to North America with the Canadian GP, but we will be treated to some of the most challenging and dramatic racing of the year at Le Mans. The Le Mans 24 Hours is the pinnacle of motor racing endurance and this year’s event is warming up to be another classic. The BRDC has a strong representative at the event with no fewer than 25 drivers taking part and several Members taking the cars for the first Qualifying session yesterday. 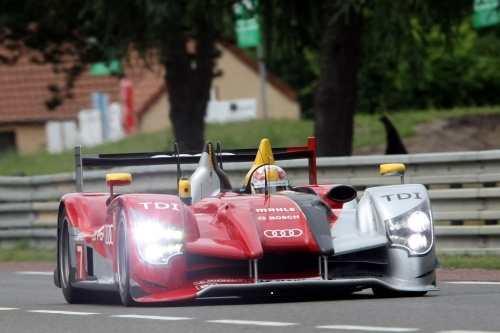 Honorary Member and eight times Le Mans Winner, Tom Kristensen, secured 7th place overall and in the LMP1 class in his Audi R15- plus TDI; the car he shares with fellow Member Allan McNish. Other Members competing in the LMP1 class were Darren Turner driving the Lola-Aston Martin BO9/60 and putting in a great qualifying to take 9th overall and in class. Andy Meyrick put his Oreca-AIM 01 in 11th whilst Emanuele Pirro took 14th in the Lola-Judd BO9/60 that he shares with Members Jonny Cocker and Paul Drayson. 1992 Formula One World Champion and BRDC Vice President, Nigel Mansell is driving in his first Le Mans this year and making headlines by sharing his Ginetta-Zytek GZ09S with his two sons, Leo and Greg , who is himself a BRDC Rising Star. Commenting on the prospect Nigel described Le Mans as “the epitome of a motor racing challenge” and the eyes of the motor racing world will be keenly fixed on how this unique father and sons team get on over the weekend. The strongest performance of the week by a BRDC Member so far came from Jonny Kane in LMP2 when he put the Strakka Racing’s Honda Performance Development ARX-01c he shares with Danny Watts on class pole. David Brabham qualified Highcroft Racing’s identical Honda Performance Development ARX-01c to second place in LMP2, whilst Jonathan Kennard was 8th in class on his first visit to La Sarthe. With many Members also in GT2, this is set to be a busy and exciting weekend at the circuit which is very much the spiritual home of the BRDC.